This and all covers and logos ©DC Comics, Inc. Earlier this year I was given the assignment of designing a logo for this miniseries, the first issue of which is out now. 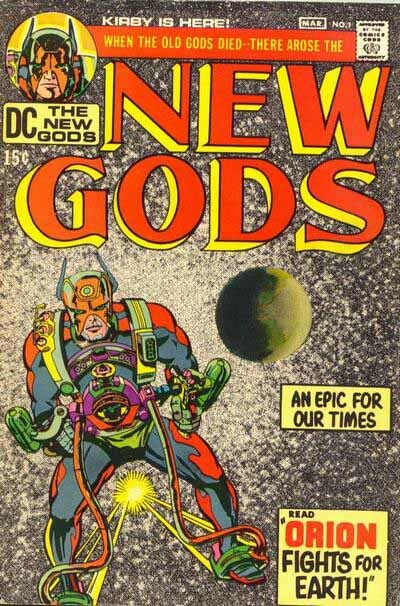 NEW GODS, the original comic, was the creation of Jack Kirby, and the first title released in the Fourth World saga he wrote and drew for DC in the early 1970s. 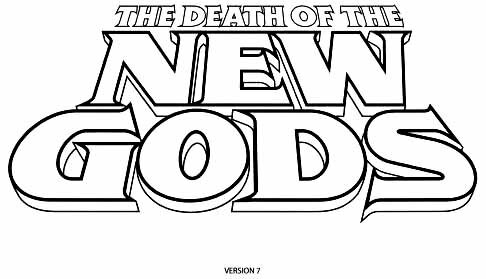 My assignment from cover editor Ken Lopez was to come up with a logo that looked back to the Kirby original while having a modern feel as well. 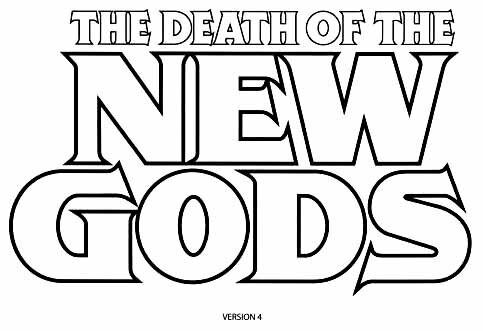 I’ve used the letterforms from the original first cover, but made them heavier, and added some subtle design changes to make them more up to date, such as the angled arms of the E and the more streamlined rounding of the G and S. The topline emphasizes DEATH as the most important word. 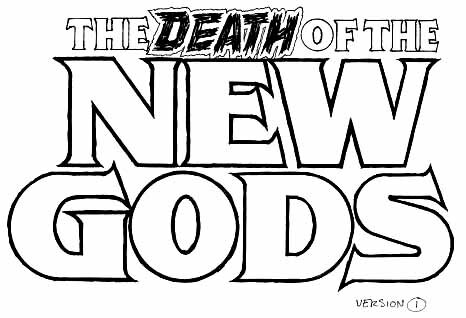 Sketch 2 uses the letterforms from my 1984 version (the only time I actually worked directly for Jack Kirby, through DC of course), and uses telescoping on the letters with one-point perspective. Again DEATH is emphasized. Sketch 3 is just another idea, one using a jagged outer edge for the letters to add energy. Same top line as sketch 2. 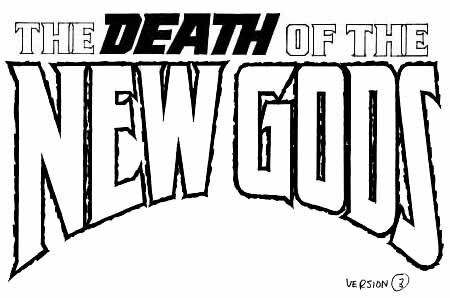 These were sent in, and in a few weeks Ken called to say they liked sketch 1 best, and thought it was close, but wanted to keep the word DEATH the same as the rest of the top line, and could they see some perspective versions? I scanned sketch 1 and traced the letters on the computer in Adobe Illustrator, creating sketch 4, revising the top line as requested. Then, using the Free Transform tool in Illustrator I angled the logo to create sketch 5, giving it a three-dimensional tilt with the top lying back and receding to a single perspective point, and making other small adjustments. Sketch 6 added a solid black drop shadow directly below the letters. 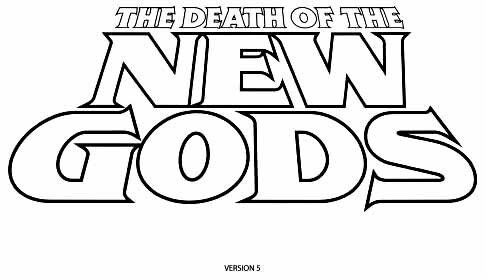 This was done in two steps, as the drop shadow of the top line had to be closer to the original letters than the one on NEW GODS to make it work. Other minor adjustments, too, so the shadow fell where I thought it looked good. Sketch 7 is the same except that the drop shadow is now shallow telescoping, receding to a second vanishing point below. 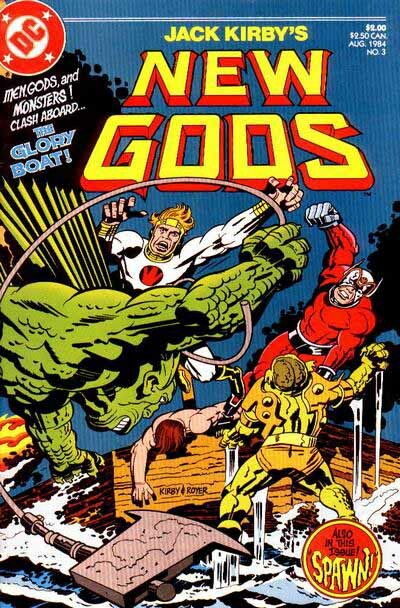 Version 6 is the one the went with, and that appears on the first issue seen above. I think there were a few other versions I threw into the mix as well, but I don’t seem to have saved them. This logo design went quite smoothly, which is not always the case, and I’m happy with the way it came out. 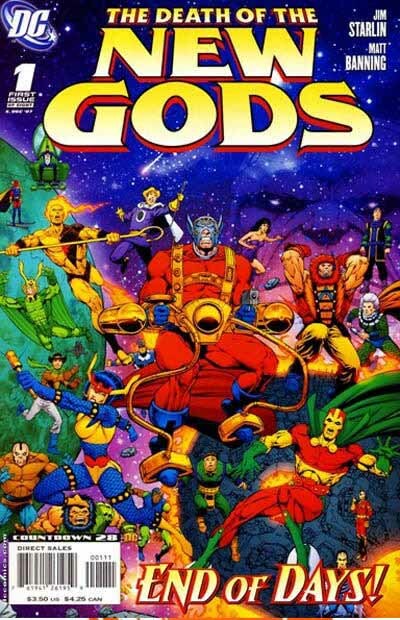 I’m looking forward to seeing what Jim Starlin does with the characters, though I know that, whatever it is, someone else will come along eventually and resurrect them. Kirby’s creations are just too good to be allowed to die permanently. And, in comics, there’s always another act. 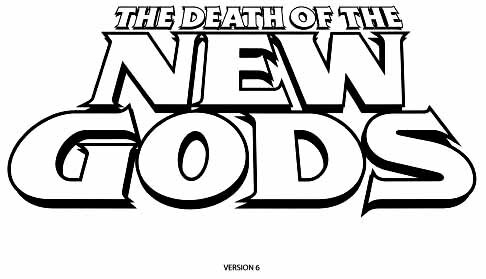 This entry was posted in Logo Studies and tagged Jack Kirby on November 6, 2007 by Todd. Dan DiDio has already used the phrase “Fifth World” on the “DC Nation” page. This post is a great natural progression from the logo studies you’ve already done. It’s nice to see the step-by-step process in action — and to compare how digital-heavy it’s now become! Thanks a lot!